This week finally the sea is getting calm in Tanjung Leman. The water is clear and the sky looks blue. I havven't see this fow quite some time. For the last few weeks there are all sorts of thunder storms, Nock-ten and even water spout which is a tornado like phenomenon happening in Tanjung Leman and Mersing. Here is the video of the water spout captured from the L.O. Corner restaurant facing the sea on 8th of June 2011. I was lucky that the water spout did not happen in the weekend before or after. Imagine this to happen while you're still in the sea. The catch this week is considered much better compared to the previous few weeks. We even caught a Tropical Sand Goby or Acentrogobius Caninus, trapped in one of our Bubu placed at the fisherman Jetty. I only snapped pictures of the fish and let it go. 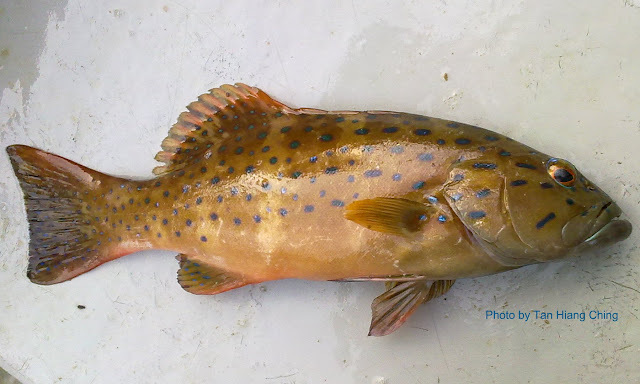 Other catch includes a 750 grams Spotted Coral Grouper, a one kilogram green eyes Orange-spotted Grouper, some other mid size groupers, some lobsters and etc. So why the fuss about a 1 kilogram or 750 gram grouper, we often see anglers with their bigger catch. Actually for groupers, 750 grams to 1 kilogram is the perfect size for best taste. Price actually drops when the grouper is larger than 1.1 kilograms. But anglers will go for bigger fish for the fun of the "fight" and not for the taste. I did not sell any of the fish and lobsters this week. The Coral Grouper had just made lunch along with some small size Barramundis and Russel Snappers. I had also decided to treat my colleagues for the Orange Spotted Grouper tonight. I'll save the lobsters for tomorrow. Gosh! I'm really gaining weight and maybe a lot of cholesterol too. Just hope the oat meal breakfast can really take care of the cholesterol built up. Maybe, sometime next week, I'll post up what kind of seafood I had been having for the last few weeks.